Clash of Clans is a massive deal. Whether or not you care for the game, franchise, or the whole genre, there’s no denying that Tencent is laughing all the way to the bank with the amount of money it’s making by selling in-game currency. It’s a pretty addictive game genre that gives the player a lot more control than, say, Crossy Road or Subway Surfers. It’s a genre worth replicating and even worth improving, and while we originally had that expectation from Call of Duty: Heroes (which frankly didn’t deliver), our hope has been rekindled by Batman: Arkham Underworld. Despite Warner Bros’ shameless misuse of the term ‘Arkham’ on every Batman-related game, this one actually has an interesting take on the universe. 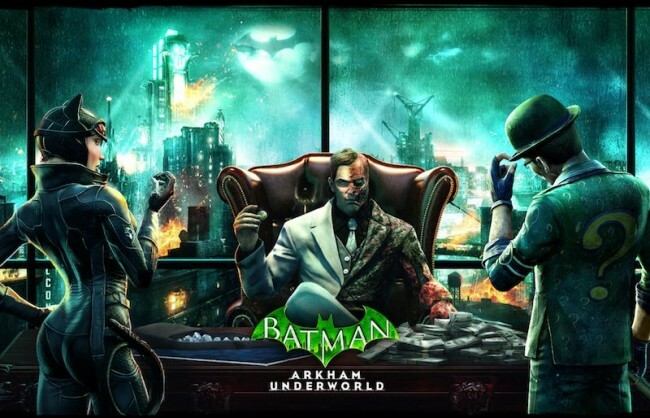 In Batman: Arkham Underworld, available for iOS with an Android release scheduled, you play as an upcoming criminal mastermind, setting your turf in Gotham City by taking down the existing ganglord, Carmine Falcone. Like Clash of Clans, you’ll be setting up a base, strategically setting up defences along with it and placing rooms in ways that suit your purpose, as well as make infiltration difficult for attackers. But that’s where the similarity ends. Each base is headed by a villain of the player’s choosing, which adds to the defence strategy of the base. The villain you select not only helps in protecting your lair, but also leads your attacks on missions and other bases. The good part is you don’t have to commit to a single villain, and you can switch between them as per your liking. What’s strangely missing though, is Batman. Sure, there are some missions where he makes an appearance every now and then, but just when you think you’re in for a major boss fight, he proves to be nothing more than a mere distraction. It’s a bit underwhelming, especially considering that you’ve been playing him in the Arkham series, and know he can do a lot more. But the game is about the villains, and it would be frustrating if all your plans were constantly thwarted by Batman, so we’ll give them a few creative liberties on that. The game has just launched, and the villain lineup consists more of the B-team, like Harley Quinn, Killer Croc, Mr. Freeze, Scarecrow, and the Riddler. There are guest appearances during missions from other characters but we presume that they may come as add-ons or unlockables at a later date. Just as in Clash of Clans, every item here has a growth tree, dictated by the growth of your central Control Room and of course the funds and reputation you have saved up. The premium currency, diamonds, are quite generously distributed in this game, compared to other similar titles, which makes it friendlier for beginners – the game is not trying to get inside your wallet as desperately as most in the genre do. Moreover, the gang you build up for missions, will stay with you even after the mission (considering they’re not taken down in action), which we thought was a pain-point in Clash of Clans. Base building seems overly simplistic here, but once you understand the dynamics of attacks, you can strategically place the rooms of your base, so that they’re not easily accessible. While we doubt that Arkham Underworld will ever gain the heights of success as Clash of Clans, it is undoubtedly one of the better games in the genre. It’s different enough to have its own identity, and the emphasis on “hero” characters makes a big strategic difference to the way you plan attacks and defence. It’s very friendly for newbies, and incredibly addictive once you get hooked on. Where it does lack is the variety of items and options in base-building, and an overall lack of challenge in AI missions, including ones with Batman involved. We played Batman: Arkham Underworld on iOS, the game is slated for Android at a later date.